Malaria is a very common disease in developing countries. The word malaria is derived from the word “Mal–aria” meaning bad air. The transmission of malaria by mosquitoes was first discovered by Ronald Ross while he was working in India (Secunderabad, AP) in 1897. Malaria is a disease caused by infection with parasites of the genus plasmodium and transmitted to man by certain species of infected female Anopheles mosquitoes. The attacks commonly present with fever, chills, nausea and vomiting, and the fever may be appear periodically. 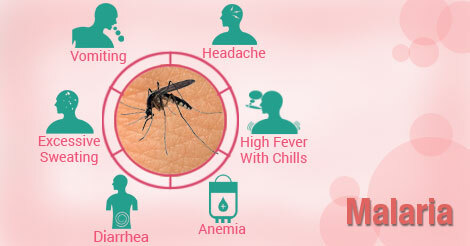 The clinical features of malaria vary from mild to severe and complicated according to the species of parasite present, the patient’s state of immunity, intensity of the infection, and also the presence of concomitant conditions such as malnutrition or other diseases. Malaria is one of the most widespread diseases in the world. Each year, there are 300 to 500 million clinical cases of malaria, 90% of them in Africa alone. Among all infectious diseases, malaria continues to be one of the biggest contributors to disease burden in terms of deaths and suffering. Malaria kills more than one million children a year in the developing world, accounting for about half of all malaria deaths globally, most of them in Africa. The risk of getting malaria extends to almost the entire population in India (almost 95%). The following states have the highest number of malaria cases, MP, Maharashtra, Orissa, Karnataka, Rajasthan, Assam, Gujarat and AP. The Government of India initiated many measures to tackle the problem of malaria which included treatment of cases and spraying of insecticides. The National Malaria Control Program (NMCP) and the National Malaria Eradication Program (NMEP) initiated in 1953 and 1958 respectively. The annual incidence of malaria came down to extremely low levels in the late 1950s and 1960s. However, the gains achieved were offset as there was a massive resurgence of malaria in both of the normal type and of plasmodium falciparum variety in India in the mid 1970s. The Government initiated a modified plan of operation, and the number of cases decreased to 2.1 million in 1984. Since then, malaria has reached a plateau.